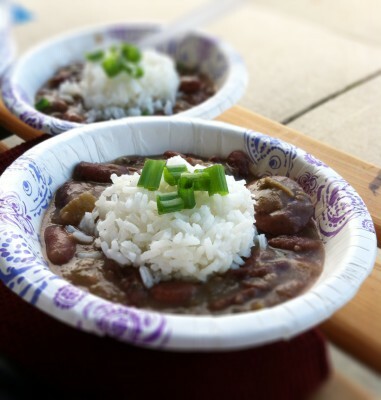 Red beans and rice is known to be a Monday tradition, but now there’s a way to enjoy it on the weekend as you prepare for America’s favorite sport, football. Now, you can tailgate with this New Orleans comfort food. It’s not as crazy as it seems. Instead of slow cooking the red beans over the stove or in the crock pot, use either a 50-qt crab boil pot fueled by propane or a 5-gallon pot sitting on top of a gas grill. Let the other guys cook up the brats, hamburgers and chili. Once the parking lot of tailgaters smell the unmistakable aroma of red beans cooking, they’ll be offering to do your laundry on Monday to get a cup or two of the tender, creamy beans. The key to a successful tailgate meal is all in the preparation. The night before, besides soaking the red beans, dice the vegetables, mince the garlic and slice the Andouille sausage. To make the cooking process easier when you arrive, store the diced onions, green bell peppers, celery and garlic together in one ziploc bag, the sliced sausage in another, and the chopped green onions with fresh parsley together in one. Don’t forget, the next morning, place the soaked red beans in ziploc bags, as well. Nothing compares to spending the early morning tailgating with your friends, your parking lot neighbors and showing pride in your team. Let the good times roll as you cook a pot of red beans out of the back of your vehicle and make the tailgating experience unique and special. You never know, the old Monday tradition just may be your new Saturday or Sunday tailgating tradition! Soak the red beans overnight. The next day, drain and rinse the beans thoroughly. Bring either a 50-qt crab boil pot (without the steamer basket) or in a 5-gallon pot over a gas grill to medium heat. Add the bacon fat. Once the bacon fat is ready, add the 5-pounds of sausage to the pot and brown. Once the sausage has started to brown, add the onions, green bell peppers, celery and garlic and keep stirring until the onions have become tender and translucent. Carefully add the 2 gallons of water to the pot along with the Camellia brand red beans, bay leaves, white pepper and dried thyme. Raise the heat to medium-high allowing the pot to come to a boil. Once the red beans are at a boil, reduce heat and cover; simmer on low for 2 hours or until the red beans are tender; stirring occassionally. Once the beans are tender, smash some against the side of the pot for added creaminess. Remove bay leaves. 5 minutes before serving, stir in the chopped green onions and fresh parsley. TIP: Same rules apply as the stovetop version of red beans, if the liquid is too thin, you can raise the heat for the pot to come to a rolling boil to burn off some of the liquid. After letting the pot boil for 10-15 minutes, reduce heat and let simmer for 20 minutes. 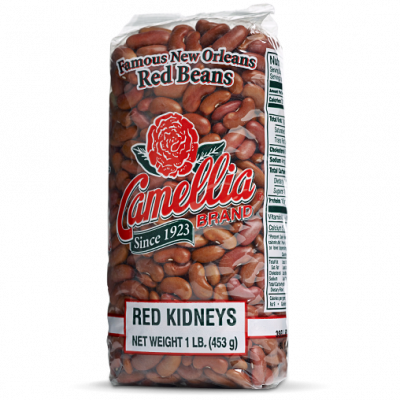 TIP: To really make this a memorable tailgating experience, add a bottle of beer to the pot when you add the red beans. The yeast in the beer will help thicken the pot along with giving the beans a unique flavor. Preheat the oven at 350 degrees. Pour half of the hot water in each of the two 9×13 aluminum pans along with half of the rice, salt and butter. Tightly wrap each aluminum pan with the aluminum foil. Place the two pans in the preheated oven for 45 minutes. Let rice sit for at least 10 minutes, untouched before checking. Fluff rice with a fork. Reseal with aluminum foil and bring along a serving spoon to the tailgate party. TIP: This should be done in the morning prior to leaving for the tailgate. Give yourself about an hour to get the rice prepared and cooked, beforehand.